Dorks in Dungeons LIVE! 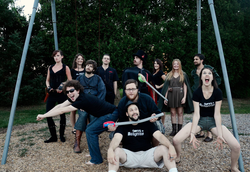 Onstage, the dice-rolling fantasy improv comedy roleplaying troupe performs once a month at The Seacoast Repertory Theater as part of their Red Light Series. Dorks in Dungeons has been awarded an Editor's Pick for best Improv Comedy in NH from New Hampshire Magazine's Best of NH. They even wrote a book, The Dorks in Dungeons Campaign Guide and Roleplaying Game. They recently finished their 1st North American tour that covered Gen Con, to Hal Con, to ImprovBoston, and more. Their very first convention was PortConMaine so they blame PortCon for creating this traveling convention beast. Dorks in Dungeons is inspired by games like Dungeons & Dragons, a rule-intensive role-playing dice game where players create imaginary characters in a fantasy world and set off on quests - all controlled by the Game Master. Game Master Brian Kelly leads the Dorks' adventurers (played by Brian Paul, Teddi Bailey, Cullen Delangie, and Molly Dowd Sullivan and more) through battles, challenges, skill checks and more while a troupe of improvisors acts as the denizens of the fantasy world. Improvisers include Michael Ficara, Glenn Provost, Robin Fowler, Kevin Baringer and Jess Miller. Dorks in Dungeons LIVE! Onstage contains language and adult themes and is not recommended for children.